Taco Sunday!!! Is that a thing? Well it should be because who doesn’t love a good, hearty taco on the weekend? Sundays for me are when I love to relax, bake and make something extra special for Sunday dinner like creamy avocado baked burritos, mac and cheese or Smoky Roasted Cauliflower Tempeh Tacos!! Do you have any funny laundry stories?! Sunday used to be laundry day when I was studying. Just to throw it out there – laundry when you don’t have a laundry machine at home is a trek. It makes me laugh looking back at our not-so-long-ago laundromat days now. J and I would always wait until out laundry piled up and was all of the sudden the size of a small mountain in our room. We’d then stuff our laundry heap in a few suitcases and lug them to the laundromat several blocks away. One of my silliest memories is when J and I decided to bring lawn chairs with us and we parked outside the laundromat to enjoy the August sun while our clothing was swirling away in the machine getting cleaned. We got one or two funny looks as we sipped our drinks and read magazines right in front of the laundromat. It’s funny how much your life changes after school. Like having access to a laundry machine at home and just maybe not waiting until it’s a heaping tower on Sunday to do it all. It’s the littlest little things in life I tell ya! 😉 I know have a lot more time on Sunday to enjoy some time in the kitchen and make homemade Roasted Cauliflower and Tempeh Tacos! Guys these tacos make a wonderful Sunday meal. 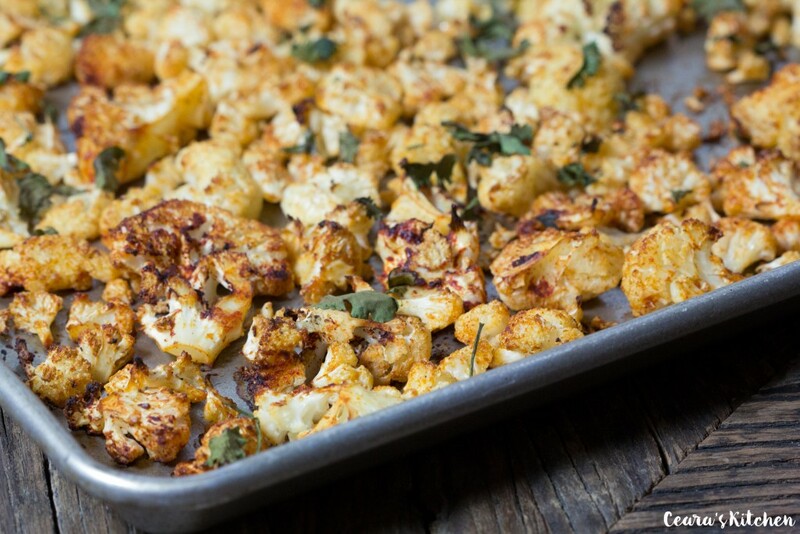 The cauliflower is roasted until it’s nice and crispayyyy. The flavorful, marinated tempeh is pan fried to perfection. If you haven’t started cooking with tempeh yet, it’s time. Tempeh is SO meaty, flavorful and an awesome texture. 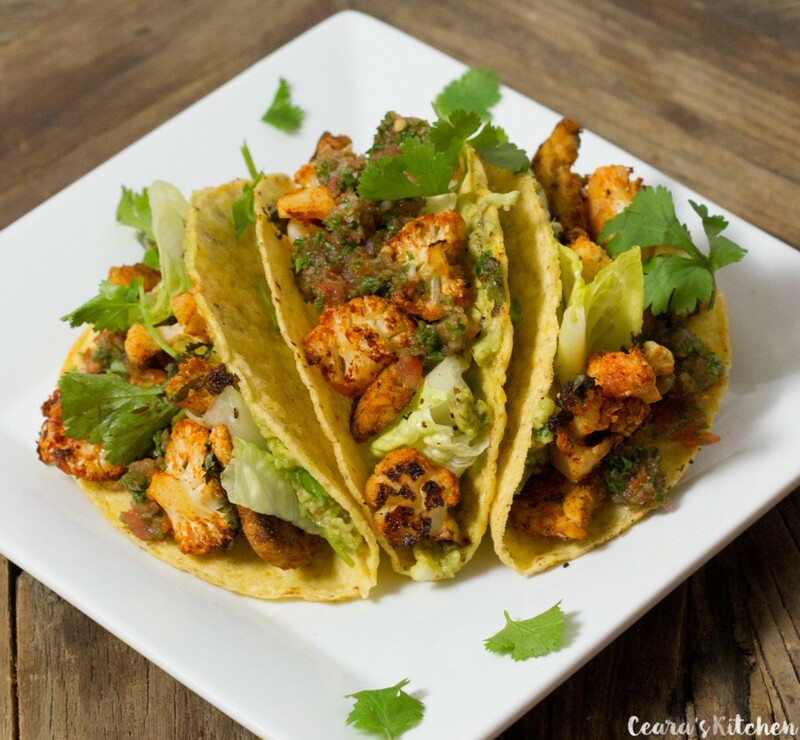 These Roasted Cauliflower and Tempeh Tacos are topped with My Favorite Guacamole and Blender Kale Salsa. Every single bite of these tacos is so dang delicious. And if you have any leftovers, the roasted cauliflower, tempeh, guacamole and salsa make an awesome salad with some greens the next day for lunch. 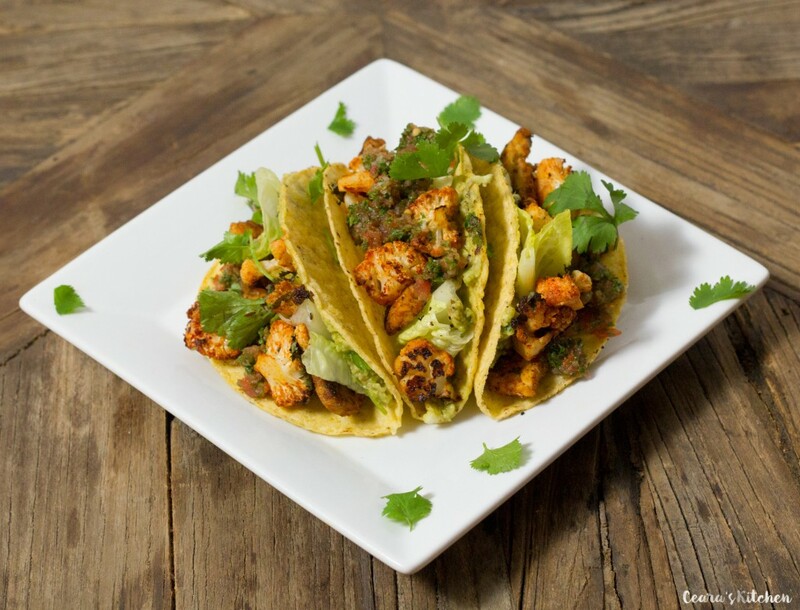 These Roasted Cauliflower and Tempeh Tacos are so incredibly flavorful and make a wonderful Sunday dinner. The cauliflower is nice and crispy and the tempeh is marinated in a delicious Mexican-style sauce. 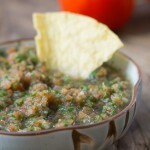 I like to use [url href=”https://www.cearaskitchen.com/my-favorite-perfect-guacamole-vegan/”]my favorite guacamole[/url] and [url href=”https://www.cearaskitchen.com/blender-kale-salsa/”]blender kale salsa[/url] in these tacos! The leftovers from the tacos make a great salad for lunch the next day with some greens. Slice you tempeh into thin 1/4 inch (1/2 cm) strips (see photo for reference). Add all the marinade ingredients to a bowl or ziploc bag (lime juice, 1 tbsp avocado oil or vegetable broth, soya sauce, cumin, garlic powder, onion powder and cilantro). Add the tempeh to the bowl or ziploc bag and toss until the tempeh is well coated in the marinade. Cover the bowl (or seal the bag) and leave to marinate for an hour. Note: you can make the tempeh the night before and leave it to marinate in the marinade overnight. Chop the cauliflower into bite sized pieces (see photo for reference). Add the remaining ingredients (lime juice, avocado oil, ground cumin, garlic powder, paprika and cayenne to a bowl or ziploc bag. Add the chopped cauliflower and toss until the cauliflower is well coated with the marinade. 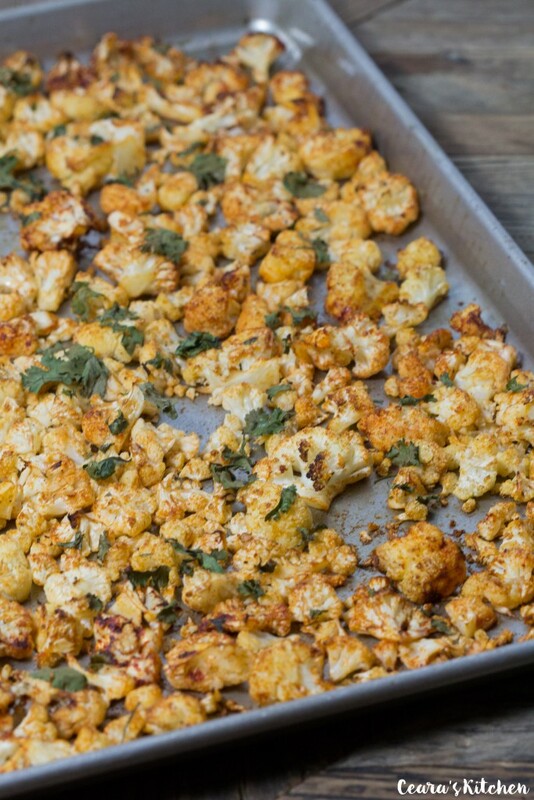 Spread the cauliflower out on a lined or lightly oiled pan and roasted for 35 – 40 minutes until crispy and slightly blackened on the outside. Do not place the cauliflower too close together or it will not get crispy. Stir the cauliflower halfway through the roasting time to ensure it cooks well and does not burn. Warm 1 tbsp avocado oil in a large pan over high heat. When the pan is hot, carefully add the tempeh strips to the pan. Cook on each side for 3 minutes or so until lightly crispy. Turn the oven down to 375F/190C. Place the tacos on a pan and warm up before assembling for 5 minutes in the oven. Scoop and spread a spoonful of the guacamole and salsa into each warm taco shell. Place a small handful of chopped lettuce into each taco. Add a couple slices of tempeh and 1/4 cup of roasted cauliflower into each taco shell. Add hot sauce (optional) and fresh cilantro on top of the tacos. 1) For an oil-free version leave the oil out of the recipe. Replace the oil used in the tempeh marinade with vegetable broth. Leave the oil used to roast the cauliflower out altogether. 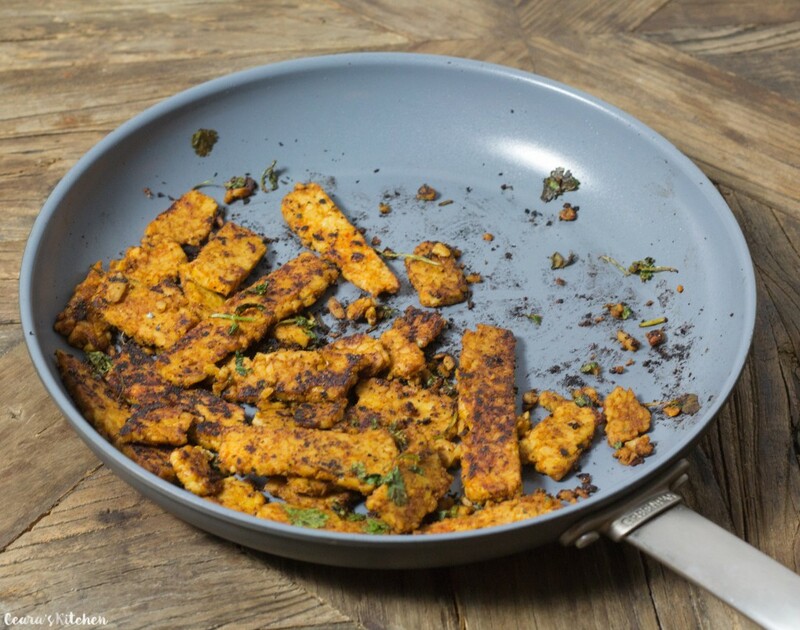 Use a non-stick pan to ‘fry’ the tempeh. 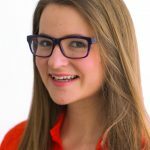 [br]2) Make sure your tempeh and taco shells are gluten free if necessary. You really have a lot of imagination. 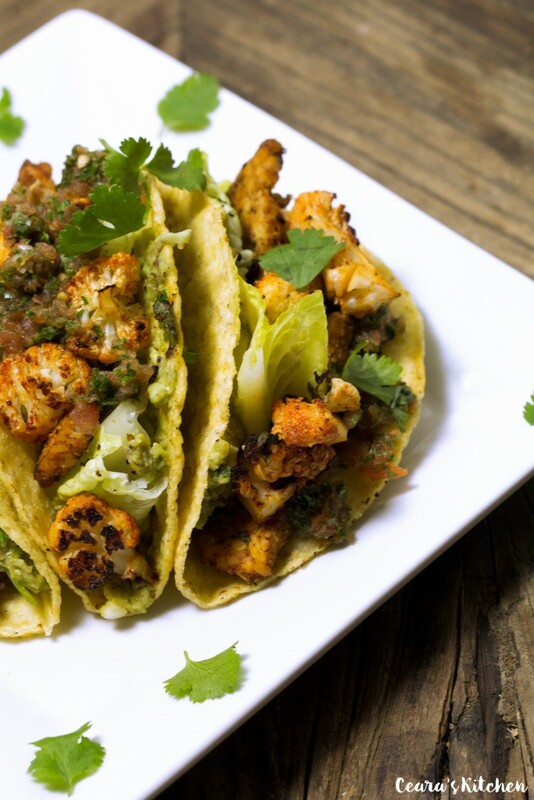 Roasted cauliflower with tacos what a great recipe. Thanks a lot. Thank you! Enjoy the tacos! With tacos this spectacular, I couldn’t care less what day of the week it is! I love the tempeh, cauliflower, guac, and salsa altogether, but honestly I could probably just eat that entire pan of crispy cauliflower with a little salsa to dip it in and be perfectly happy! It looks SO good, I love paprika! 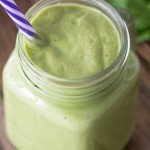 Such a great idea to add cauliflower and tempeh instead of meat! How come I waited this long to make a vegetarian taco?